I add Perspective switcher to status bar. [Module of the podcast: Perspectives ] . Gregg bring up a point that Eclipse Perspective feature confuse him when switching Perspectives. 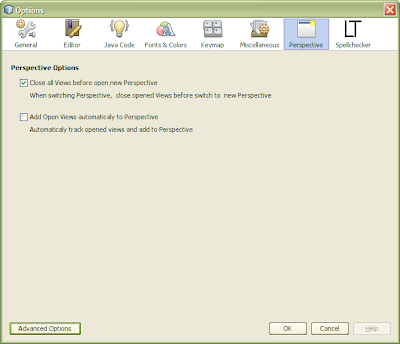 It made him harder to find his views(windows) because those are automatically closed by Perspective.Perspective is quite a controversial feature. Some people like them, some people hate them.But always there is answer so I made some options to personalized Perspective behaver . Netbeans 6.1 is out, and a update is needed because the plugin tab in options does'n appear. I found the tab, is under miscellaneus now. You will not develop further this plugin?